This is one of those desserts that people will talk about for years to come. 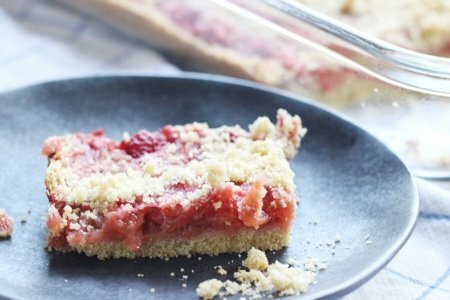 You don’t have to tell them that these rhubarb bars are low in sugar. 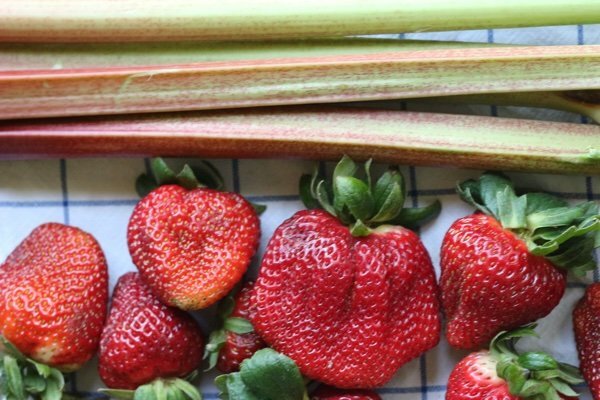 The key to using less sugar in a dessert is to pump up the flavor with a tasty fruit or vegetable – like strawberries and rhubarb. These taste sweeter than they are and are definitely a treat. I cut the sugar in the crust and the topping and it makes the whole dessert more sophisticated. Instead of tasting SWEET SWEET SWEET, you taste tart, butter, and fruit. I love this bar with coffee. If you aren’t eating rhubarb right now, I would encourage you to go get some. I can usually find it in the produce section in a basket of some kind. 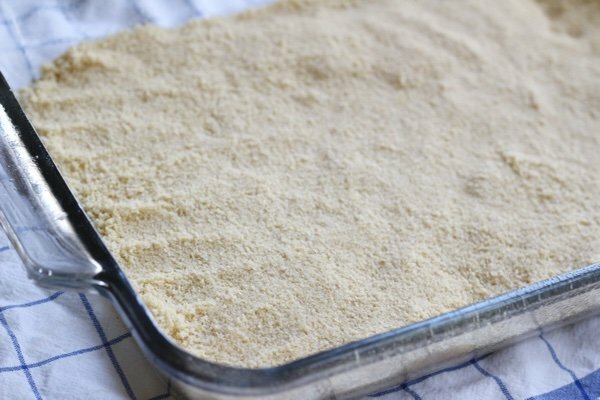 This recipe utilizes almond flour because it has great texture and flavor. The crust here is so easy to make in a food processor that it is almost as fast as a packaged crust (which I would not recommend). You whir the ingredients in the food processor and then press them into the bottom of a 9x13 glass baking dish. I used my food processor to dice the strawberries and rhubarb as well. This recipe takes more steps than I usually advocate for, but these taste uniquely remarkable. There is a depth of flavor when you use whole foods (almonds, rhubarb, strawberry) that you can’t get in a fluffier dessert. Be sure to let these cool or you will have a hot mess (literally). After 1 ½ hours cut them into squares and put them in at tightly sealed container. Mine tasted fresh after 4 days in the refrigerator. Because these are a bit hefty, it is difficult to keep eating them in one sitting. I love their dense texture and crunch on the top. Bring these to a bakesale and they will be the first to go. I promise! 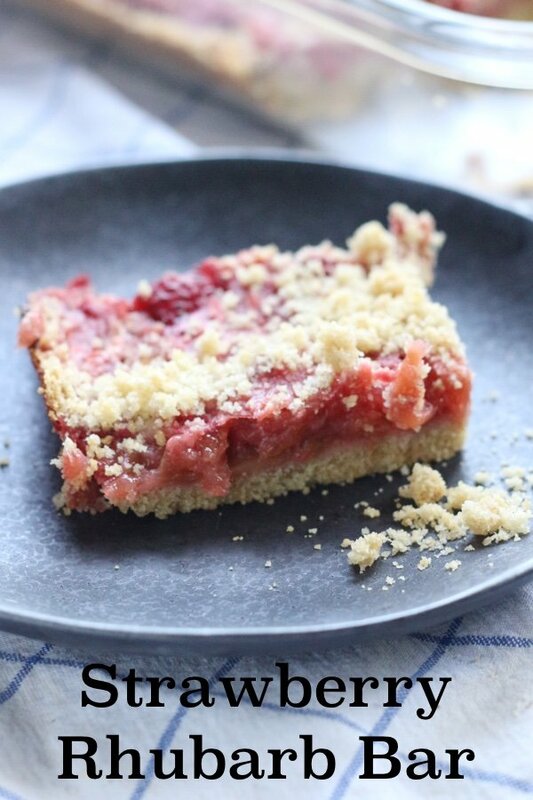 How do you serve rhubarb? Spray a 9x13 glass casserole with non-stick spray. Combine almond flour, whole-wheat flour, all-purpose flour, sugar, and salt in a food processor. Add butter, egg, and vanilla and pulse until the mixture is a little clumpy. You may have to scrape down the sides of the bowl. Reserve ½ cup of the mixture for the top of the dessert. Press the rest into a 9x13 glass casserole. Heat the oven to 400 F. To make the filling mix 2 cups strawberries, 2 cups rhubarb, orange juice, sugar, and cornstarch in a medium sauce pan. Bring to a simmer over medium heat stirring constantly until mixture is very thick (about 3 minutes). Mix in 1 cup of strawberries and 1 cup of rhubarb. Spread mixture on top of crust and add the reserved crust to the top by sprinkling it over. Bake the bars for 15 minutes and reduce the oven temperature to 350 F. Bake for 25 minutes more until the top is lightly browned. Let cool for 1 ½ hours before slicing into bars. Umm umm. The perfect recipe in our neighborhood, since both are currently ripe!! What a yummy combo. And I love a dessert recipe that has protein in it. Thank you, Lisa! This sounds absolutely amazing. My husband and I recently returned from a trip to Lancaster County in Pennsylvania. The strawberry-rhubarb pie was off the hook! This is just what I am looking for to replicate the taste of that yummy combination sans all that sugar. Thank you, Lisa! I will be making this over the weekend. I love anything rhubarb.